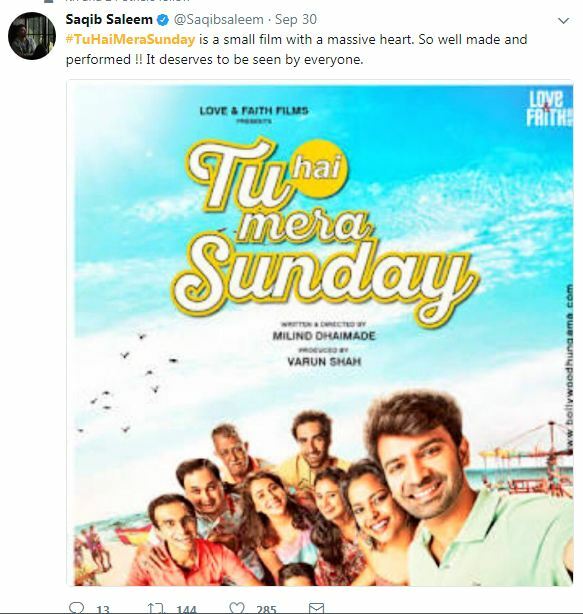 Milind Dhaimade’s directorial Tu Hai Mera Sunday that stars Barun Sobti, Shahana Goswami, Vishal Malhotra, Manvi Gagroo and Rasika Dugal is all set for its release on 6th October. The cast and makers kept several special screenings for their known friends from the industry. Wishes and congratulatory messages started pouring as soon they came of watching the movie. Many known directors and actors came to watch the film and have shown love towards this film through their social media. The movie is based on five friends trying to find a place to play football on a Sundayand how their personal lives are connected to this entire incident. This is a complete Sunday movie package is what we can assume from its trailer, this fresh content seems like is going to bring a fresh breathing air amongst Bollywood. After Newton this is going to be the next film that will bring good content to Indian cinema, we all hope for the best and wait for this movie to release on big screens.